Tax Justice Network: ITEP debunks loopy Laffer. Again. "The most politically brilliant (albeit economically unconvincing) idea in the history of fiscal policy: “supply-side economics” [Laffer is, among other things, the founder of the Laffer Center for Supply Side Economics]. Supply-side economics liberated conservatives from any need to insist on fiscal rectitude and balanced budgets. Supply-side economics said that one could cut taxes and balance budgets, because incentive effects would generate new activity and so higher revenue. The political genius of this idea is evident. Supply-side economics transformed Republicans from a minority party into a majority party. It allowed them to promise lower taxes, lower deficits and, in effect, unchanged spending. Why should people not like this combination? Who does not like a free lunch?" Indeed. Also take a look at our blog Laffer in la-la-land, pointing to an entertaining if depressing take-down of Laffer, for more fun. Now Laffer's been peddling his snake oil in a new bottle recently: he has been looking at the evidence from high-tax states and low-tax states in the U.S., and saying that the low-tax states are the ones that have grown most, and the high-tax states have grown the least. And - what a surprise - Rupert Murdoch's Wall St. Journal has treated his study with awe. "The nine “high rate” states identified by Laffer have actually seen more economic growth per capita over the last decade than the nine states that fail to levy a broad-based personal income tax. 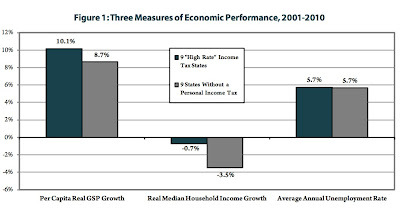 Moreover, while the median family’s income, adjusted for inflation, has declined in most states over the last decade, those declines have been considerably smaller in “high rate” states than in those states lacking an income tax entirely. Finally, the average unemployment rate between 2001 and 2010 has been essentially identical across both types of states." And there's a nice graph, too. So how, exactly, did Laffer get it wrong? It's very simple, really. Laffer's findings were caused by population growth in the high-growth states, not by economic growth stimulated by tax cuts (and incidentally, that population growth had nothing to do with tax cuts either). And that's it, really. There are a few other factors, too: some of the states, for instance, were able to afford tax cuts because they had large natural resource windfalls. "Whether looking at income levels, unemployment rates, or economic output per person, states with “high rate” income taxes have economies that equal or surpass those in states lacking an income tax. The most commonly cited analysis purporting to show the opposite." Read their report here. And it's accompanied by another one which provides a devastating take-down of Laffer's economic analysis methods. Or take a look at this interview with Bruce Bartlett, who was one of the original champions or Ronald Reagan's supply-side economics, and who has now changed his mind rather dramatically. He is now an outcast among many of his former supporters. "There is a disconnect between the facts of what taxes do, and the mythology. . . the tax debate is a code for an attitude towards the individual versus government . . . it is a signalling mechanism, which tells people 'you are one of us' "
Let's see if the Wall Street Journal finds space on its crowded pages for this one. We won't be holding our breath. Laffer never stated that cutting taxes would always create more growth & revenues. He merely said there was an optimal level of taxation. Anonymous: untrue. He did say exactly that. Take a look at the Laffer Curve, and consider its implication. The curve is a nonsense, but still, that is that is says.